You’ve finally hired the perfect new addition to your team. Congratulations! The process of finding, interviewing, checking references, and hiring can be a long and tiring road, unless you hire an executive search firm to make it simple. Regardless of how you got there, you’ve hired your ideal candidate… but now what? Now it’s time to onboard your new employee. Many companies skip over this step, though it is crucial as strong onboarding is essential to engage new hires. Why is this? When an employee starts their first day at a new company, they are overwhelmed with new stimuli. From a new desk to new coworkers, new location to new tasks; without guidance it can be extremely difficult for them to know what it is that they should do first. That’s why we have come up with a few tips to help improve your onboarding process! The first step to properly onboarding a new hire is making introductions. This can include introducing them to the office space, their coworkers, as well as the work that is currently taking place and what they will be doing. By introducing the individual to all of these things, they will feel more comfortable moving around the space, and most importantly, asking their colleagues questions that they may not have asked if they did not know them. This welcome package allows for the new hire to spend their first day going over what is specifically expected of them, and what kind of work they can look forward to completing moving forward. It also allows for them to set up their work space, shake the nerves, and get ready to dive in to their new work. 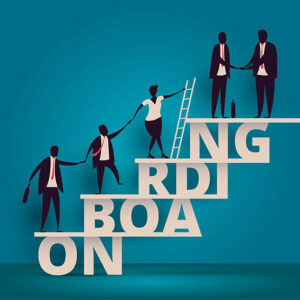 There are many ways to successfully onboard a new hire and they are very important. The first few days at a new job tell the individual a lot about the company, and the company a lot about the individual. A strong onboarding process gives the new hire the best chance of showcasing their skills, which really is best for both parties. If you are looking for a company to perform a worldwide executive search to find you the perfect candidate to onboard, HRWorldnet can help. Our premier hospitality recruiters can assist you in finding the perfect candidate: from application to hire. Call us today or visit our website to learn more about us, what we specialize in, and what we can do for you!